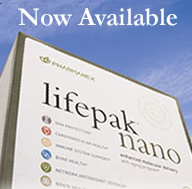 Lifepak Nano uses nanotechnology to individually "wrap" each nutrient molecule, making the nutrients "nano-ized." This keeps these nutrients from clinging together and maximizes each molecule's contact with the GI tract, allowing for increased absorption in the body. Put simply, up to 10 times more nutrients can be absorbed by the body. For example, a recent study showed that "nano-ized" CoQ10 was five to ten times more absorbable in the body than the traditional form of CoQ10. Lifepak Nano contains vitamin, minerals, and antioxidants including carotenoids such as beta-carotene, lycopene, lutein, and more in addition to CoQ10 in "nano-ized" forms. With more than 60 antioxidants, essential vitamins and minerals and omega-3 fatty acids, Lifepak Nano is the most comprehensive nutritional supplement on the market. Each daily dose of Lifepak Nano supplies 1,200 milligrams of omega-3 fatty acids and more than 60 different antioxidants that fight against damage-causing free radicals and promote healthy cells in the body. Nourishes and protects cells, tissues, and organs in the body with the specific purpose to guard against the ravages of aging. Helps maintain normal inflammatory responses in the body. Feeds and helps protect the brain with DHA and EPA. Offers superior DNA protection against damaging free radical attacks by providing the body with important antioxidants and phytonutrients such as alpha-lipoic acid and catechins. Protects cell health with an antioxidant defense network. Helps protect cardiovascular health with a comprehensive blend of omega-3 fatty acids and other nutrients. Provides comprehensive bone nutrition support.